We are pretty sure most of you out there have never heard of Amsonia, and we actually didn’t start using this plant until recently when we discovered it is an incredibly versatile and low maintenance perennial for nearly any Kalamazoo landscape. We really like the ‘Halfway to Arkansas’ cultivar, which grows to nearly 2 1/2′ tall in full sun to moderate shade. This low maintenance sunny plant has deep, dark green foliage, and looks like a big billowy pillow. Considered a ‘motion’ plant, Amsonia responds to the slightest breeze, creating a great effect when planted in masses or on hills. A native cultivar, Amsonia is also drought tolerant, salt tolerant, deer resistant, attractive to butterflies and makes for an effective ground control. Butterfly is well known for attracting butterflies and caterpillars, but it is also one of the most low maintenance plants you could have in your sunny landscape. Butterfly milkweed will grow to about 2′ tall, in full sun to light shade. The flowers are a bright vibrant orange, almost neon, from July to August. 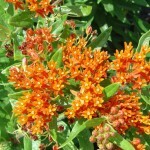 Butterfly milkweed is a native species perennial that can grow in nearly ANY condition. It is a tough, drought tolerant, deer resistant perennial that can grow in some tough soil conditions, with little to no irrigation. Talk about low maintenance! 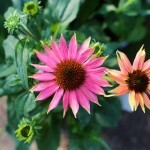 Echinacea, or coneflower, is another great low maintenance plant for a sunny location in Kalamazoo. 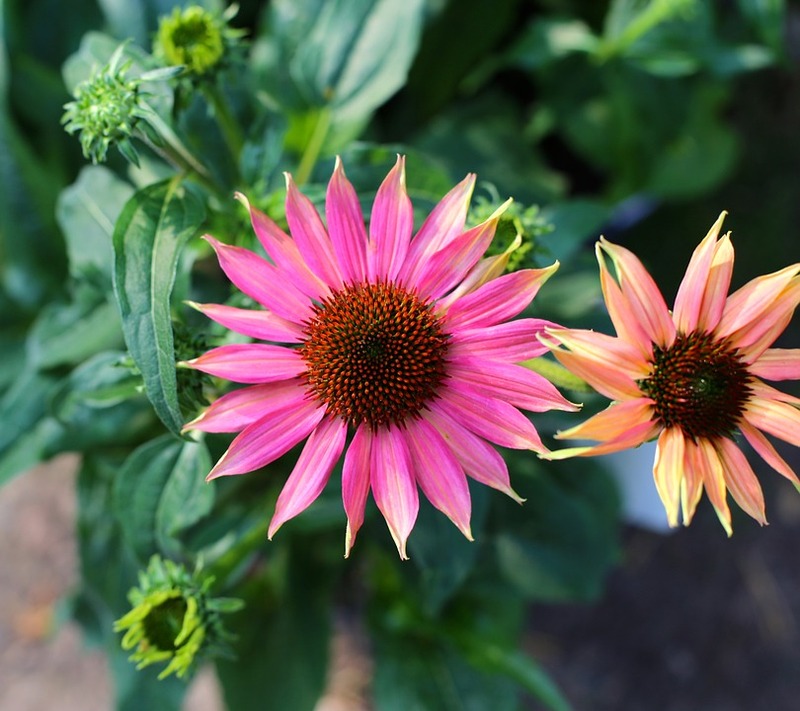 Coneflowers are a native hybrid that come in a wide variety of cultivars, some being short at only 10″-15″, while others can reach 3′ tall, in full sun to light shade. Butterflies LOVE coneflowers, and so do we because they are deer resistant, drought tolerant, some are even salt tolerant, yet you can use them for cut flowers. Conflowers come in an incredible array of colors, white, pink, yellow, orange, red…even bi-color combinations of pink and yellow or pink and green. Blooming from June to October you can expect to enjoy this plant all summer and into the fall. Nepeta, also known as catmint, is a carefree low maintenance perennial that will love your sunny to lightly shaded Kalamazoo landscape. Two of our favorite nepeta cultivars are; ‘Limelight’ with its bright green foliage and blue-purple flowers growing to a mere 8″, and ‘Six Hills Giant’ which has dark green foliage and blue-purple flowers but grows to a tall 3′. 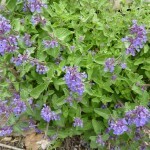 Nepeta makes for a great groundcover or specimen plant, with very aromatic foliage. Nepeta is also a long bloomer, starting in April and continuing through October. It is deer resistant, drought tolerant, salt tolerant, and attracts hummingbirds and butterflies. Can’t ask for much more! There are an astounding number of different sedums out there, some are short at only 1″, others are taller at 2′, some are evergreen to semi-evergreen, while others are deciduous. The foliage is no different coming in a huge range of colors; variegated, dark green, green, yellow, yellow-green, green-gray, gray-blue, blue-purple, dark purple, red-purple, and some even turn brilliant shades of red or purple in the fall and winter. While the flowers come in shades of reds, pinks, yellows, and whites, blooming May to October (depending on the cultivar). 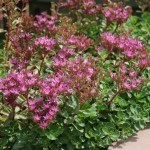 Sedums make great groundcovers that create a carpeting effect, can be used in rock gardens, along boarders and pathways, and some are steppable when used between flagstone or pavers. Wait there’s more…they are deer tolerant, drought tolerant, and can attract butterflies. Phew…that’s a whole lot of awesomeness delivered by one plant. Make sure to check out our recent projects to get ideas on your next project, or contact us today if your ready to start! Don’t need sunny low maintenance plants? Check out our low maintenance plants for shade gardens. 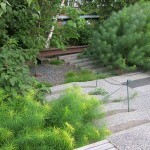 Looking for low maintenance grasses? We’ve got you covered here.